Well, it has been one of the worst starts to a year in trading history with stocks plummeting to levels from 4 years ago, so a lot of the traders in eToro took big hits this month, particularly those who hold a high percentage of their portfolio in stocks. However, every cloud has a silver lining, and this proved to be a useful time to see how traders reacted to these losses and how much this impacted their accounts. This helped me to remove a couple of traders from my shortlist who made big losses, and gave me more confidence in some traders who (even though most of their portfolio was made up of stocks), only made minor losses. Of course, when everything goes down, this also presents another buying opportunity, so I am looking to invest in the next month. I’ve got my account verified on eToro and am torn between investing $1000, which will give me a $300 eToro bonus, or if I invest $2500, then I will get a bonus of $1000. The only thing is that these bonuses are paid in the way of eToro points, which can only be withdrawn after you have made a certain amount of trades. I’m not 100% sure of how this works, but I think the amount you can withdraw gradually increases over time. 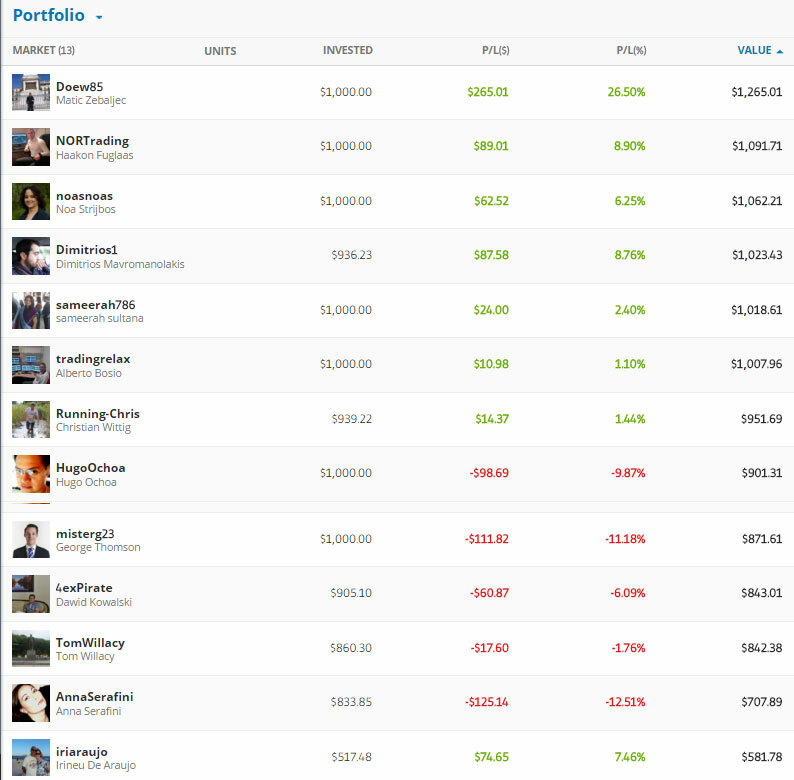 Finding the right eToro trader to invest in can be a bit daunting at first, especially for the newbie. There are thousands of traders to choose from, some with incredible percentage gains, but you really need to be careful and spend a bit of time interrogating their statistics. eToro gives you a great search filter which helps you to choose who to invest in and using a few simple filters you can start to find traders who match your risk profile. What is their risk level. How many open trades do they have. Often if they have lots of trades open, this may mean they are chasing the loss, hoping it will come back one day, rather than taking the loss. This is bad, because you will then take on these bad investments if you invest in them. Remember it’s good to have a balanced portfolio of at least 5 traders, investing at different risk levels and across different markets in case something goes wrong with one of them. You can have a look at my eToro Trader Reviews here and look at some of the criteria I used to select them. All I need to do now is take the plunge and make an investment!